Agatha Christie's The Mirror Crack'd stars Angela Lansbury as Christie's aged but sharp-witted Miss Marple, whose crime-solving instincts are called into service following a murder at the temporary estate of Hollywood star Marina Rudd (Elizabeth Taylor), in England to shoot a movie directed by her husband Jason (Rock Hudson). The traditional rogues' gallery of suspects includes Mr. Rudd's assistant and lover Ella (Geraldine Chaplin), Mrs. Rudd's rival Lola Brewster (Kim Novak), and unscrupulous producer Marty N. Fenn (Tony Curtis). Guy Hamilton directed this British production for Thorn/EMI, and it hews to the Agatha Christie style for the most part. The language has been roughened up in a few scenes (I don't remember Christie using some of these words in her novels or plays), new "humor" has been added, and the casting trots out a number of well-established Hollywood stars, apparently available at reduced rates in 1980. The overall effect is that of a well-produced TV movie, with decent performances and visible attention to detail, though the 1953 setting doesn't play a big part in the proceedings. A corny black-and-white "drawing-room" opening segment does a nice job of reminding us of the genre's conventions, before the film-within-the-film ends and the equally conventional story proper kicks in. Agatha Christie's strength was always in her plotting, which I won't go into here for fear of spoiling the story's surprises. Unfortunately, her characters tend to cut strictly to type, and it's difficult for these talented actors to find anything of substance on which to chew. Angela Lansbury does a fine job as the independent, intelligent, morbidly humorous Miss Marple (though one can't help seeing this as an audition for her long-running TV series Murder She Wrote); Elizabeth Taylor and Kim Novak are given some wonderfully catty lines to hurl at each other; Tony Curtis has a lot of fun as a stereotypical Hollywood producer and Edward Fox is suitably Scotland Yard-ish as Miss Marple's movie-mad nephew, Inspector Craddock. But the overall impact is muted; Christie's plays have always been popular as community theatre fodder, and this all-pro production still seems "amateurish" somehow, especially with such winks and nudges as Rock Hudson's onscreen "take" following a Doris Day joke. While the film is well-structured, it often seems as though everyone got together to make a movie for fun, under the misapprehension it would never be seen by a paying audience (case in point: Ms. Taylor's hideous hat, resembling nothing so much as a shower cap with flowers glued on). 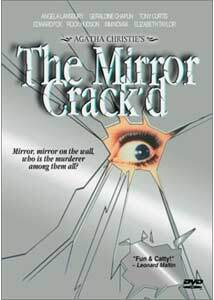 Agatha Christie fans will want to add The Mirror Crack'd to their collections; the story is still recognizably Christie's work, and it's very much a classical murder mystery despite its tendency to go for the laugh on occasion. It's just not as faithful to its source as some other adaptations of the author's novels—more like a strange little Hollywood offshoot of the Christie Canon. Image Transfer Review: Anchor Bay presents The Mirror Crack'd in its original 1.85:1 widescreen theatrical aspect ratio, with a crisp new anamorphic transfer drawn from a fairly clean source print. The film has an inherently "soft" look in many shots, but color and texture are well-represented by the digital transfer. There's a visibly higher level of "grain dance" during the optically-composited credits sequences, but the film looks just great overall. Audio Transfer Review: The Mirror Crack'd on DVD retains its original theatrical monophonic audio, presented in Dolby Digital 2.0 for ProLogic-decoding to the center speaker. Dialogue and John Cameron's jovial, intentionally melodramatic score are captured nicely with competent frequency range, though there's no low-end activity to speak of. A very clean presentation, sounding much better than I had anticipated for a monophonic 1980 release. The film's theatrical trailer is presented in 1.85:1 anamorphic format, though the print is grainy and the audio noticeably tinny compared to the feature. Also included are "two" TV spots, though I was unable to detect ANY difference between "TV Spot 1" and "TV Spot 2" after several viewings of each; both are 30-second, 1.33:1 television promos, windowboxed in 16:9 anamorphic format. Neither spot is particularly enlightening or surprising, but it's always nice to have the promotional materials for history's sake. Brief biographies and limited one-page filmographies, covering Ms. Lansbury (in her own Miss Marple section) and her co-stars Geraldine Chaplin, Tony Curtis, Edward Fox, Rock Hudson, Kim Novak and Elizabeth Taylor. In keeping with the Christie theme, this section's menus focus on character names, with the actors' names less prominently displayed. Fans of traditional murder mysteries will find much to enjoy in Agatha Christie's The Mirror Crack'd, though the production takes liberties with the author's style and doesn't always take itself seriously enough. Anchor Bay's DVD features a superb transfer, and will be a nice addition to any Christie fan's collection.